Annual Recap Details Environmental & Construction-related Professional Liability Insurance Trends, Conditions & Forecasts. Hamilton, NJ, April 03, 2019 --(PR.com)-- RT’s ECP, a leading specialty resource for environmental and construction-related professional liability coverages, has released its 2019 Market Update. This annual recap represents the collective knowledge of the company’s expert specialists and the trends driving change, innovation and growth in this complex niche marketplace. 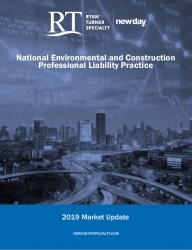 The 2019 Market Update explores specific trends and conditions for environmental and construction-related professional liability coverages in the areas of Contractor’s Pollution Liability (CPL), Pollution Legal Liability (PLL), General Liability/Pollution Legal Liability (GL/PLL), General Liability/Contractor’s Pollution Liability/Professional Liability (GL/CPL/PL), Architects & Engineers (A&E) Professional Liability, Contractor’s Professional Liability (CPrL), Owners Protective Professional Indemnity (OPPI) and Real Estate Developers (RED) Professional Liability. --GL/PLL remains strong due to the increasing number of insureds seeking coverage for unique or unusual exposures that are not readily available in the traditional marketplace. These include products pollution, sudden and gradual site pollution, and situations where exposures may straddle over several lines of coverage. To view the entire 2019 Market Update please click here or feel free to reach the company directly at newday.rtspecialty.com or 609-298-3516 for more details.